Under service conditions timbers as construction members frequently deteriorate, especially they get bio-deterioration, Therefore not only reliable certification of initial strength of timbers, but also evaluation of reduction of strength of timbers must be very important. Furthermore macro detection of deteriorated locations in timber required as first diagnosis to observe the state of deterioration and specify the positions to evaluate the strength, especially in the case of local deterioration of timber. The methods for this purpose must be reliable and practical which is nondestructive, prompt, easy to detect in fields and possible to detect over a wide area. Thermography is a promising technique, easy to detect wide area, the method is nondestructive and can be used in field. In this paper we studied some factors effecting the surface temperature of wood, like density, knots, decay and cavity. In the fiber direction dry wood conducts heat 2.5 times faster than in the transverse direction. This ratio for wet wood is only 1.5, because water equalizes the difference. Considering the transverse directions, wood conducts heat somewhat faster radially due to rays then tangentially, but the dense latewood bands may compensate or overcompensate the effect of the rays. The ratio of radial to tangential conductivity is 1.3 - 0.9 depending on the volume of ray tissue and on early late wood contrast. Table 1: Diffusivity of wood [m2/s] at different moisture and density level . The heat propagation in a body is described by the Fourier equation and depends only on diffusivity as material property, and the actual geometry, initial and boundary conditions. The solution of the Fourier equation is rather complex, especially when real boundary conditions are taken into consideration. The solution of the Fourier equation for a plane layer is rather complex and given by Gebhart  based on Heisler  calculations and the results are given by graphical form. The interesting part of Heisler’s calculation, that surface temperature depends not only on time, initial wood and air temperature, diffusivity but also depends on heat conductivity. Because heat conductivity of wood depends on density, surface temperature of wood in transient depends on density as well! This is rather important fact in our investigation, because biodeteriorated wood has lower density than intact wood. To verify the theoretical results on surface temperature the following experiment was conducted. 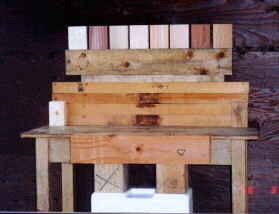 The dimension of the six clear wood samples were 10 by 8 by 2 cm. The moisture content of the samples were 12%. Six different species were involved, represented 6 different density level between 265 - 948 [kg/m3] . Table 2 shows the species and density. Back and the sides of the specimens were covered by heat insulator material to minimize the effect of the ends. Table 2: The wood species and the density of the specimen involved in density-surface temperature test. The specimens were conditioned in oven at temperature 60 oC and the cooling down of the six specimens were tested by thermography. The air temperature was 22 oC. The applied thermograph made by company Avio is a compact unit with excellent temperature resolution. The temperature sensitivity of the machine is 0.01 oC! The image resolution is 100*256 pixel was far enough for our investigation. The surface temperature is a function of the wood density, see figure 4. This experimental result is in coincidence with Heisler’s calculations. A linear relationship was found between the density and surface temperature, when the cooling time is over 20 minutes. Based on this result, coniferous knot (density is higher than the wood material around) and decays on surface (decayed wood density is lower than intact) can be detected by thermograhy. Deciduous knot are detectable as well, even there is no difference in density, but fiber direction is differ and results difference in heat diffusivity. In the test described above the specimens were conditioned at a relative high (60 oC) temperature level and the transient were observed by thermograph. High thermal energy were applied in the tests. It would be difficult to use this technique in the evaluation of an existing wooden structure, because the dimensions. We tried to use the daily temperature change as thermal induction. For this reason we moved our unit to the structural test building, where the big openings (doors and windows ) provided almost outdoor conditions in term of temperature change. A large column (diameter 70 cm) made from hinoki was evaluated. High temperature difference (1.3 oC) was measured between knot and the wood material around. The diameter of knot was 5cm. After a successful test using the natural temperature change we carried out an all day long (from 5.24 to 18.57) test, to find the best time for thermographic inspection. The six density samples, sample with brown decay and sugi sample (10 by 10 by 80 cm) contains knot were placed really outdoor. Every 10 minutes we measured the air temperature and the surface temperature of the specimens. Specimens located under a roof were the openings were big, no wall from left and right side. All the specimen placed in a shadow. Fig 2a: The measured surface temperature difference of knots and decayed area and the air temperature (scale on the right side) in Tsukuba, Ibaraki, Japan on 3rd of August, 1998 at the outdoor test. Immediately after a rapid temperature change high temperature differences were observed. The positions of the peaks in air temperature plot are in coincidence with the temperature difference plot. The best image and the highest temperature difference observed at 8.57 and 10.37. The temperature difference reached the 0.7 oC level. If we compare this value to the temperature resolution of the Avio thermograph (0.01 oC) a reliable and safe detection of surface defects like knot and decay is possible. Fig 3: The surface temperature of six different species versus density after a rapid air temperature raise. As in a previous experiment we found, that the surface temperature depends on density (figure 1.). A similar dependence was found after a rapid air temperature increase on figure 3. The slope is different on figure 1. and 3. Because the direction of temperature change is opposite. We can conclude, that detection of defects on surface like decay or knot is possible by thermography simply using the daily temperature change. The study of disturbing factors such as direct sunshine and timber dimensions are notincluded in this work. Five specimen made from hinoki is prepared for testing the possibility of detecting cavity by thermography. A simple cavity is used to simulate the internal decay. The dimensions and location of cavity is given on figure 5. Reference specimen A has no cavity and specimen B has an open cavity. In specimen C, E and D cavity located inside and the distance from surface is changing: 3, 7.5 and 15 mm respectively. Thermography is widely used in nondestructive testing of fiber reinforced plastics, where the material thickness is less than 10 mm. The sensitivity of the technique is depends on the thickness and heat conductivity . Because the relative high thickness (our case 45 mm) and the low heat conductivity of wood, the cavity detection is especially difficult. In spite of these difficulties similar experimental arrangement was used for testing wood. A homogenous and powerful heater and the Avio thermograph are the main components of the applied setup. The heated or the opposite surface temperature distribution is detected soon after (15s) the heating period, see figure 4. Fig 4: The applied setup. Fig 5: The five specimens used for detecting cavity. A: control sample, B: open cavity,C,D and E the surface - cavity distance is 3, 15 and 7.5 mm respectively. The success of the thermographic inspection depends on the homogeneity of the heater . We used a 1500 W line heater with 80 cm effective length. The sample - heater distance is an important parameter. A closer position results in a higher defect sensitivity and at the same time higher surface temperature on the heated face. Burning of the surface starts over 200 oC and this temperature was selected as allowable maximum temperature. So 45cm as heater-sample distance was selected. The surface temperature versus heating time is shown on figure 6. The relative temperature distribution along the heater, that represents the homogeneity of the heater is shown on figure 7. Fig 6: The surface temperature on the heated surface versus heating time. The heater - sample distance is 45 cm. The heated surface temperature depends on distance from heater, heating time, and position. The highest temperature measured at the center of the heater. The relative temperature distribution along the heater is plotted on figure 7. The temperature field is relative homogeneous within +/-32 cm from the center of the heater. Fig 7: The relative temperature distribution parallel to the heater. The heated surface temperature was measured in the case of specimens C and E, where the cavity is located 3 and 7.5 mm from the surface. Different heating time was applied. Figure 8. and 9. shows the surface temperature difference versus time. Fig 8: The temperature difference of specimen C versus time. Specimen is heated from 45 cm from the heater. Heating period finished at 0 second. Fig 9: The temperature difference of specimen E versus time. Specimen is heated from 45 cm from the heater. Heating period finished at 0 second. In the case of specimen C very clear indication of the round shape cavity appeared on the thermographic image both in positive and negative part of the curve. In the case of specimen D clear indication of the round shape cavity appeared on the thermographic image only in the negative part of the curve. In the case of specimen D no indication of the round shape cavity appeared on the thermographic image. The opposite (not heated) surface was measured as well. A very clear indication of the round shape cavity appeared on the thermographic image in all the cases (specimen B,D,E) except the reference specimen A. The temperature difference of the reference specimen is calculated from the surface temperature in the geometric center and 9 cm away from the center. Specimen B is heated on the face where the open cavity is located. Fig 10: The surface temperature difference for specimens B,D and E. Temperature measured on the opposite (not heated) surface. We carried out the above cavity tests with 19 cm as heater-surface distance. The temperature difference in that case is significant higher, but the surface temperature was higher as well, so the surface layer of the specimens (except specimen C) has been burnt. The results of the cavity tests are compressed in table 3. Detection of the cavity is possible but a powerful (1500 W) heater is necessary. In-situ application of this method looks difficult, because the heater. Thermography as a possible tool of nondestructive testing of wood has been analyzed. The theoretical consideration of heat transient in wood was verified by experiments successfully, like the effect of density on surface temperature and the heat conductivity in different anatomical orientation. Two outdoor tests were carried out, to evaluate the applicability of the daily natural air temperature change as heat transient. More than 0.7 oC temperature different was found between intact and decayed wood temperature, so this relative simple method can be a useful tool in the evaluation of old wooden structures. Similar temperature difference was found between knot and around the knot. Specimens containing cavity was used to model the decay inside the wood. The distance between cavity and surface was 3, 7.5 and 15 mm. 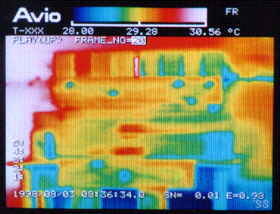 All the three hidden defect were found by thermographic inspection. An electrical line heater used to increase the surface temperature and 2 - 9 oC different was found soon after the heating. Hopefully these results may contribute to an easy and reliable inspection of old wooden structures, but further field test are necessary. Dt= temperature different; min.r.= minimum temperature different reached after heating.